It’s 7:30 AM on a Monday morning at the Columbia Campus of Pope John Paul II Catholic Academy in Dorchester, Massachusetts. 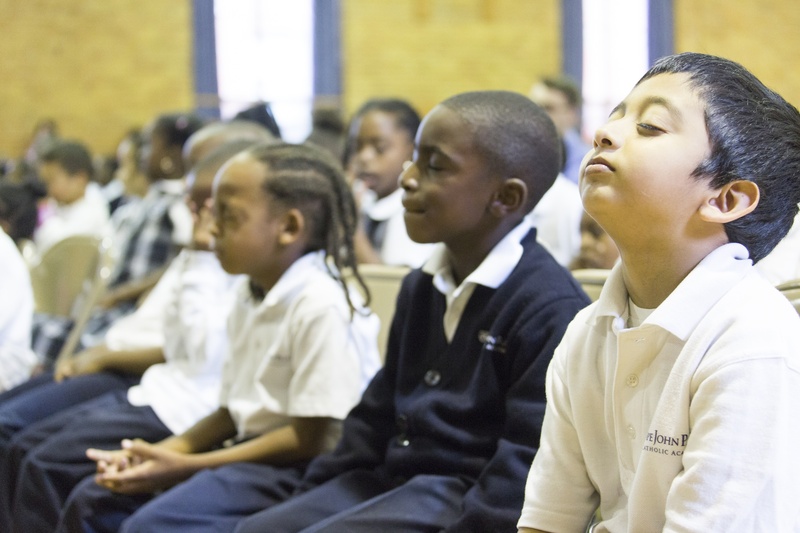 Kids grades K-8 have filed into the gymnasium for their usual morning meeting. Sitting in rows with backpacks and coats still on, they suddenly hear a saxophone above them play, “Oh When the Saints, Go Marching In…” The song continues with violin, melodica, cello, and voice as four teenagers come on stage to join the saxophonist above them in the crow’s nest. 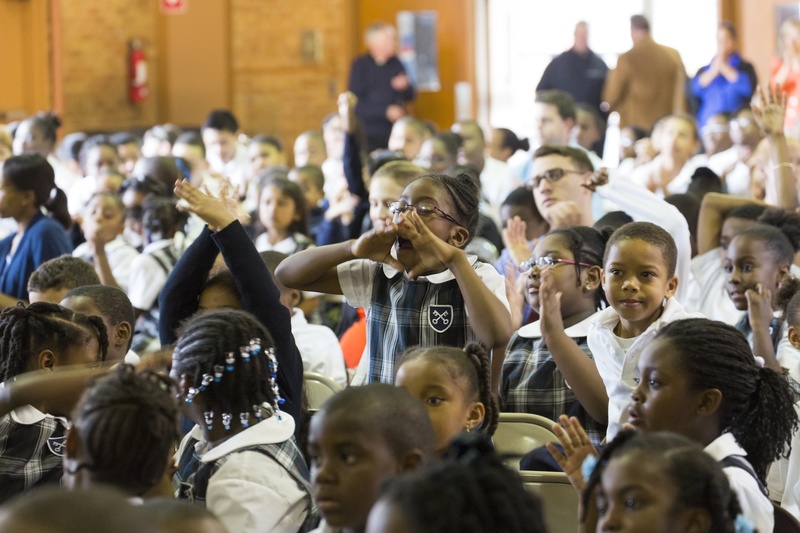 This was the kick-off to From the Top’s residency at Pope John Paul II Catholic Academy, an elementary school located on multiple campuses in the Dorchester and Mattapan neighborhoods of the City of Boston. 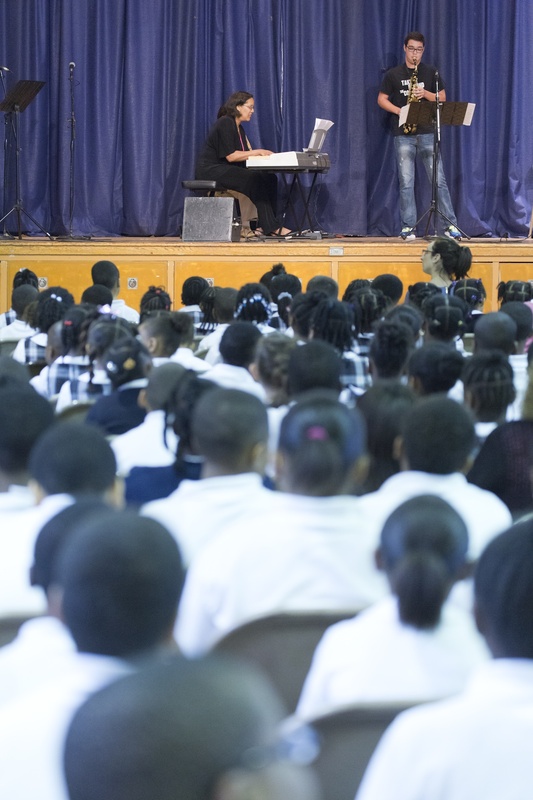 The residency was comprised of a series of assemblies and concerts at three of the school’s four campuses, bringing the power of music to 1,000 kids. Thanks to a grant provided by the Free for All Concert Fund, From the Top was thrilled to visit this school in our hometown, especially since the school is so committed to music education. 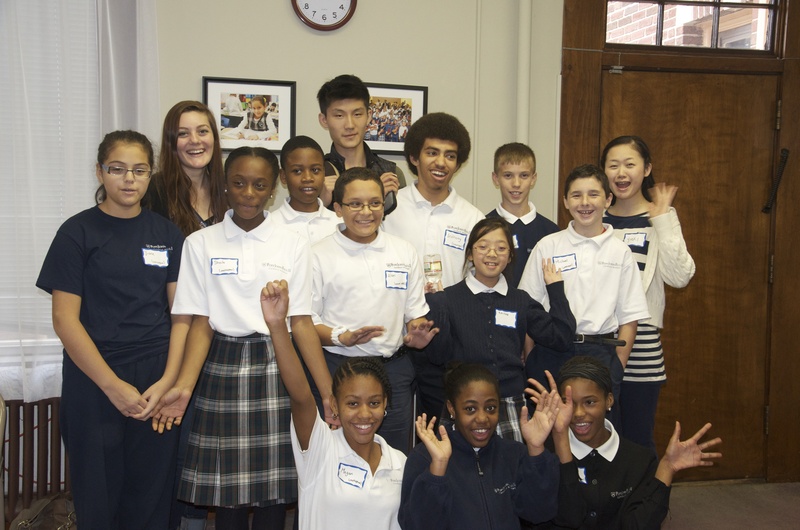 600 Pope John Paul II students participate in an after-school string program. 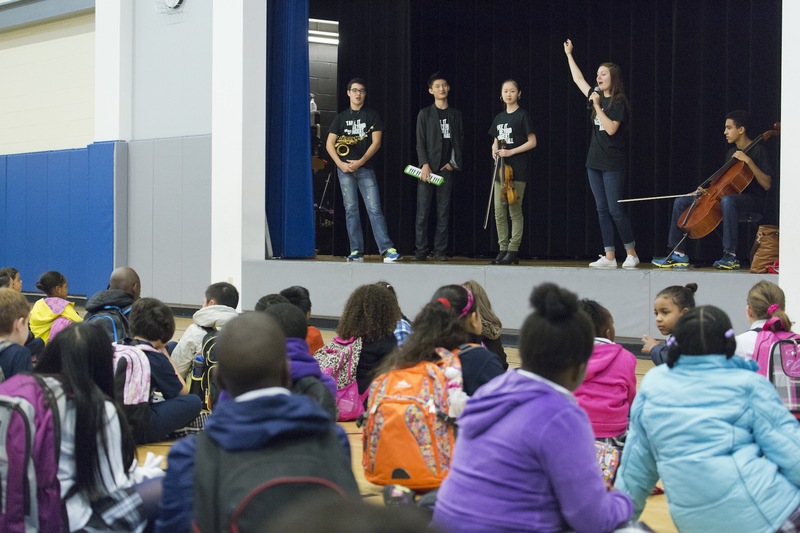 From the Top’s visit with five performers from our October 6 radio taping at NEC’s Jordan Hall served to inspire this school full of budding musicians to embrace music and keep practicing. Mary Swanton, Music Director at Pope John Paul II Catholic Academy, opened the assemblies by telling her students that the From the Top performers left her speechless! 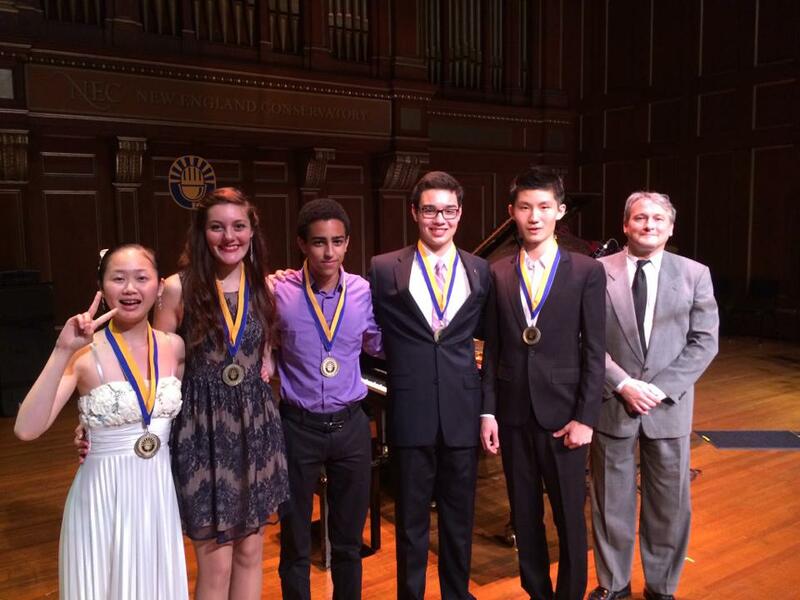 Performers following their radio show taping at NEC’s Jordan Hall on October 6. The interactive assemblies drew inspiration from the stories and talents of our From the Top performers – 17-year-old saxophonist Chad Lilley from Olney, Maryland; 17-year-old cellist Lev Mamuya from Newton Highlands, Massachusetts; 16-year-old pianist Niu Niu from China but now living in Natick, Massachusetts; 17-year-old mezzo-soprano Olivia Cosio from San Francisco, California; and 16-year-old violinist Yuki Beppu from Lexington, Massachusetts. Students imagined what colors and images they heard in Lev’s performance of a Debussy Cello Sonata – purple, black, red, and rainbows. Yuki shared her dream of making more kids listen to classical music and after an intense performance of Ysaÿe, she played her violin along with a track of Lady Gaga’s “Applause” to the delight of the dancing and cheering audience. 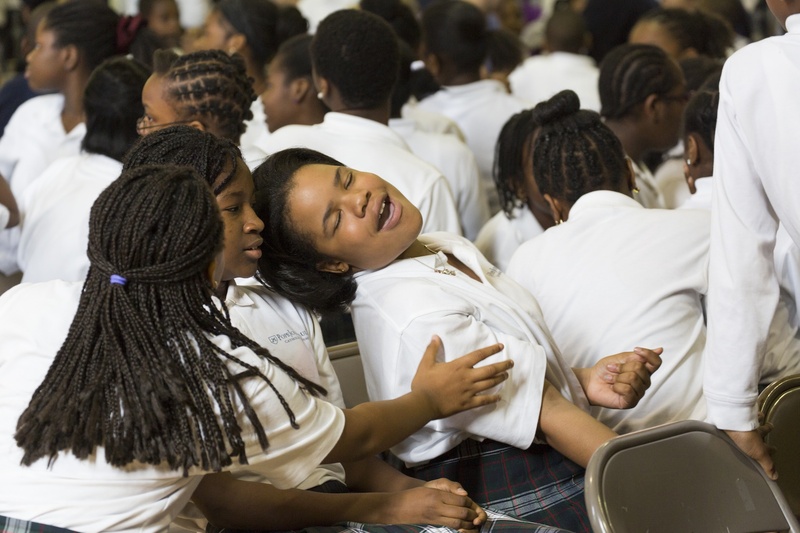 Olivia joined a middle school chorus from Pope John Paul II’s Mattapan campus in a performance of Beyonce’s “Halo” and then led the entire audience in a round of vocal exercises. Niu Niu shared how hard it was to move to the United States from China and then had jaws dropping as he played Chopin’s Revolutionary Etude. The day long residency was every bit a learning experience for our From the Top performers as it was for the students at Pope John Paul II Catholic Academy and provided a very real set of challenges and opportunities for their Arts Leadership Orientation Workshop. You can hear Chad, Lev, Yuki, Niu Niu, and Olivia in their From the Top radio episode the week of November 18. From the Top performers with PJPII leaders. Learn more about the Free for All Concert Fund.